Beware of Hurricane season! 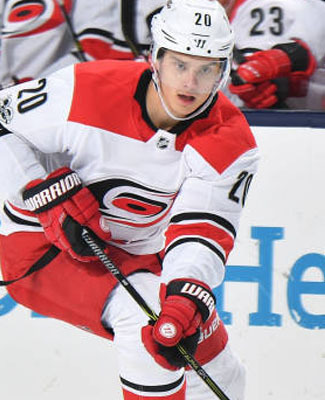 The Carolina Hurricanes are really starting to ramp up on the offense and right in the thick of things is Finnish foward Teuvo Teravainen, who took his game to a brand new level and earned himself his first Player of the Week nod on the OpiatedSherpa.com hockey pools. In terms of Carolina Hurricanes, he is only the third player in the last 10 seasons to hit the Player of the Week in Raleigh and the first since Jeff Skinner did it back in Week Fourteen of the 2014 season. It was a monster week indeed, as Teravainen and the Hurricanes played in four games in Week Seven, where he compiled 5 goals and 5 assists for 10 points, claiming the outright win for the nod. A couple of players had 9 points in the week, but with the big game on Sunday night, the tide turned in his favour. In Dallas on Monday, he started his week with a hat-trick and an assist against Dallas, added another pair of helpers against the Islanders on Thursday, another assist against the Sabres on Saturday and then capped off the week with a pair of goals and an assist against the Islanders again. The 10-point week was incredibly huge in his overall numbers, as he now has 8 goals and 19 points in 19 games played this season, currently good enough for 51st overall in pool scoring, which would have made him the opening pick of the 3rd round in this year's draft. Ryan ended up taking a chance on the young Finn, way down in the 10th round, 233rd overall, so now he's looking like a major bargain in the pool these days and it almost boosted Ryan's team into further acclaim, as it had led it to a 34-point week in Week Seven. Unfortunately for his team, it dug itself into a bit of a hole to start the year and finished the week in 19th. It was a pretty good race for the Mover & Shaker in Week Seven and it was unfortunate for most of us in the hockey pool, the race was happening at the top of the standings, as a couple of teams decided to try and pull away this week. In the end, Kristy & Don were the better of all the teams in the weekly scoring standings, finishing with 37 points and jumping up into 2nd place in the overall standings. The Carolina Hurricanes connection continues down into the Mover & Shaker, as the pool's first duo bought heavily into the Hurricanes at the draft, including forward Sebastian Aho, who led their team in scoring for the week with 9 points, only a point short for consideration in the Player of the Week nod. Jordan Staal also had 6 points and Jeff Skinner had 3 points, so as the Hurricanes start to score more, Kristy & Don should be doing much, much better. Also having notable weeks for the duo were Roman Josi of the Predators and Keith Yandle of the Panthers, each picking up 4 points each, while Viktor Arvidsson of the Predators, Anthony Mantha of the Red Wings and Ben Bishop of the Stars all finished with 3 points. Kristy & Don's team had a bit of a slow start in the early part of the year, but ever since Week Three, their team has started to find their stride, moving into the top 10 and slowly crept up the standings, to where they now stand in 2nd place. Their team is now tied for 3rd in goals scored (62), their forwards are 6th in the pool, defense is tied for 5th and their goaltending is currently 8th overall, so they are doing good things at every position and that seems to be the key right now. This is only their second week this season above 30 points, but they have been fairly consistent, past the shortened Week One, where they have been able to snag 20 or more points a week. Now that the Hurricanes are finding their way, this duo could be a tough one to stop. It was a tough week for Troy in Week Seven, as nothing was firing at a good pace for his squad, whatsoever. His team finished with the weekly-low of 12 points and it dropped his squad down from 15th to 22nd and if there was a positive in there somewhere, the Waiver Draft starts next week and his team has improved its chances for a better selection. Not really a good consolation, is it? Sam Bennett of the Flames, Rickard Rakell of the Ducks, Vladimir Sobotka of the Blues and Tyler Toffoli of the Kings led the way for his team with 2 points each, but those are not very remarkable numbers, coming from guys that Troy would expect much more from. All but one of his forwards was able to get a point and then only one defenseman otherwise was able to pick up a point, so there was a real disappointment on his back end. Troy's top player through the first seven weeks of the season is New York Rangers defenseman Kevin Shattenkirk, who currently has 17 points, but he wasn't supposed to be that guy, as Troy had also managed to snag Brent Burns of the Sharks, who has been a big disappointment with only 7 points to his name, so far. For the most part, Troy's team is very healthy, ranking 4th in skater games played, but he bought high on Winnipeg Jets goalie Steve Mason, who failed to keep the number one job and has now been relegated to backup again in his career and there are a few players on his pool team that have also fallen behind in their expectations, hence the Basement Dweller. Back at the top of the standings, Jeremy's team took back 1st place with a near-Mover & Shaker week and they have now opened a 5-point lead on Kristy & Don, who had the Mover & Shaker team for Week Seven. Brian, who briefly took over 1st place last week, dropped down to 3rd place, only 8 points back of 1st. Teams outside of the money kind of fell off a little bit and they are certainly in need of a boost, as Dale B. sits in 4th, 3 points back of 3rd, while 10 points back only gets us down to 6th place, and now 20 points is down at 13th place. The top teams need to take a break, so everyone can catch back up and make this really interesting again! We have some eliminations! One of the favourites to take the title, Chris, and another that has surprisingly lasted this long, Benson, fell to the way of the schedule in Week Seven, now leaving us with eight teams in the mini-game. Chris had both Martin Jones and Jonathan Quick on his team and Quick was pulled in his last start, Chris' last chance, only after 11 minutes, giving up three goals. A bitter disappointment, I'm sure. Benson, on the other hand, had a platoon starter in Jaroslav Halak, and a full-on backup in Carter Hutton, so his chance of victory were slight, at best. Still in the mini-game heading into Week Eight: Stacey M., Jeremy, Tony, Mike, Wilton, Cam, Stacey C. and Grant. The plus/minus department was good for the hockey pool, as all 25 teams were a combined +44 on the week, a new season-high for a week. Brian's team led the way in the week with a +15 rating in Week Seven and his team jumped up to 4th place in the standings. Dale B. also had a pretty good week, finishing with a +10 rating in Week Seven and he padded his Week Six lead, which now stands +37, 10 points over Steve. It's worth noting that Week Seven had a new weekly record in the non-counting PIM pool, as Grant's team set the new weekly-high with 43 minutes in penalties. Wes, thanks in large part to the Radko Gudas major and game misconduct, just ahead of his suspension, also had a top-3 week with 37 minutes and he still carries a big lead in this non-game with 188 minutes overall and a 37-minute lead over Brenda & Seward. It was a crazy good week in the scoring department, as Week Seven is now 2nd only to the opening week in scoring per NHL game, as the pool collected 13.5 points per game on the schedule and there were 45 games played, giving us our 2nd-best total week in the season with 609 points combined. If we had a couple more games on the schedule at that rate, it would have been a record week. Skater and goalie participation have somewhat leveled out, with players starting to come back from some longer-term injuries, but it hasn't been great. We still have two more weeks of action, before the pick ups from the Waiver Draft start playing, so it will be a little while yet, before we see participation numbers shoot through the roof again. Sunday seemed to be a good night to make examples of some cold players and Victor Rask was surprisingly one of those players. The Carolina forward has not been among those in the offensive explosion of late and that cost him a game in the press box last night, as he sat for the game against the Islanders. Rask only has 5 points in 18 games with the club this season, good enough for only 399th in pool scoring, hence the healthy scratch for the game. The Hurricanes were able to pull off another big win, so it will be interesting to see if he'll draw back in. Rask is certainly among the candidates for Dale B. 's team to find a drop in the Waiver Draft, but with the rest of his team doing so well, it could be a little while before he makes that pick. Florida forward Radim Vrbata was unable to play on Sunday night against the Anaheim Ducks, as he took a puck in the face in the game previous against the Kings and didn't return to that game after the incident. The team is calling him day-to-day right now and Vrbata's status ahead of their return home on Wednesday night against the Maple Leafs will be questionable, at best. We'll have updates, if they pop up. The luck continues to elude Wes' team again this season, as another injury will keep his team down in the bottom-third, if it continues to persist. His team finished the week with 18 points and in 21st place, 34 points out of the money. A couple of good switches and some better luck can go a long ways. Ahead of this season, the Minnesota Wild were definitely one of those teams hugging the salary cap ceiling, so they are doing all that they can to keep the math on their side. On Sunday, the demoted a couple of players, including Joel Eriksson Ek, to likely save a few bucks on their overall spending. Eriksson Ek, a rookie, doesn't have to pass through waivers and the paper transaction is made easier that way. The Wild do play tonight, so it should be expected that he gets the call-up again. Even if he was to play a game or two in the AHL, it could do well for his confidence, something he doesn't seem to have at the NHL level at the moment, as he has struggled to find his scoring streak yet this season. Clayton's team, the rookie leader in the pool, was expecting more from him and is also considering this rookie for a drop next week. Just before publishing the Newsletter, the Dallas Stars announced that goaltender Kari Lehtonen is taking a leave of absence for personal reasons and will be away from the team indefinitely. The nature of his absence was not disclosed, but I'm sure you could imagine that it doesn't sound very good. For Brenda & Seward, this isn't very good news, despite Lehtonen's contributions to their team numbers have been fairly limited, as the number two guy in Dallas. Lehtonen only has 4 points in seven appearances this season, but he won't be getting anymore, if he's not playing.